George Gilbert Scott was the son of a clergyman and was an architectural pupil of James Edmeston. In 1832-4, Scott worked as an assistant to Henry Roberts, the architect for Fishmonger's Hall. His own first architectural work was what he later described as "a very ugly design" for a new rectory for his father to move into. Two months after Scott had been taken on as an assistant by his friend Sampson Kempthorne, Scott's father died, prompting him to set up on his own. He sought patronage from influential friends of his father and touted for work as an architect in areas where his father had been known. As a result, he received several commissions including four workhouses in Northamptonshire (Brackley, Northampton, Oundle and Towcester). Soon after setting up on his own, Scott took on William Bonython Moffatt as his assistant and later partner. 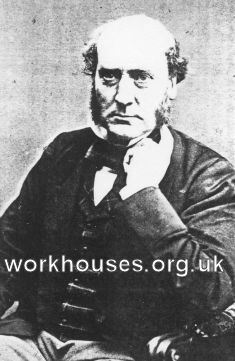 Over the next 10 years Scott and Moffatt designed over 40 workhouses. Their early designs were based on the Poor Law Commissioners' model plans which had been designed by Kempthorne. However, they soon adopted their own distinctive unique layout evolved by Scott. This plan was derived from Kempthorne's square plan, but with the front-facing arm of the central cross removed. Instead, a long single-storey range placed at the front contained the porter's lodge, board room, receiving wards and chapel. A central entrance archway led through to an inner courtyard either side of which were boys' and girls' yards. The main building still retained a central hub containing the master's offices and quarters. To each side were male and female day rooms and dining halls on the ground floor, with dormitories above. The rear range contained kitchens and scullery. Behind were workrooms, laundry, bakehouse etc. with an infirmary block at the rear. The large scale map of Guildford workhouse (below) is typical variation of this design. The earlier buildings of this type were in a simple Classical style. Unions that adopted this design include: Bideford, Boston, Guildford, Horncastle, Liskeard, Louth, Newton Abbot, Penzance, Redruth, Spilsby, St Austell, St Columb Major, Tavistock, Tiverton, Williton, and Witham. Scott and Moffatt's later work shows an increasingly rich style with a preference for neo-Elizabethan and neo-Jacobean designs, for example as at Dunmow in 1838 and Windsor in 1839. Scott went on to have a prolific and varied career with his designs including the Martyr's Memorial in Oxford, the Midland Hotel at St Pancras railway station, and the Albert Memorial. He was knighted by Queen Victoria in 1872 and buried in Westminster Abbey. After his death, The Builder magazine published an "incomplete" list of 732 buildings on which Scott had worked. William Bonython Moffatt was the son of a small builder and another pupil of James Edmeston. He was originally taken on by Scott to assist with drawings, and then as site architect on the four Northamptonshire workhouses. The two became partners in 1838 with Moffatt cultivating work in Devon and Cornwall while Scott concentrated on the East Midlands. The two worked and travelled ceaselessly, seeking out new commissions and carrying out existing ones. Their partnership ended until 1845 due, largely it seems due to pressure from Scott's wife who found Moffatt tactless and extravagant. Moffatt's subsequent work included the Earlswood Hospital in Redhill, The Shire Hall in Taunton, and the Crystal Palace Hotel. In 1860, he was imprisoned for six months over a debt of £1,000. An employee wrote of him that "he was an ugly man with hair all over his head" and that there was frequently chaos and a failure to pay his staff and others. Moffatt died in 1887. Cole, David (1980) The Work of Sir Gilbert Scott , The Architectural Press, London.